"Commodore USA announced in March that it was reviving the much-loved Commodore brand, but ran into problems when it transpired that company chief executive Barry Altman had negotiated a licensing agreement with a company — Commodore Gaming (formerly Commodore International) — that was itself a licensee of the brand. The actual holder of the rights to the brand was Commodore Licensing BV, itself a subsidiary of Asiarim Corp.
"We are ecstatic to be partnering with Commodore Licensing BV in this new, exciting product launch," Altman said in a statement on Wednesday. "The legacy of the Commodore C64, which sold over 30 million units, making it the best-selling computer of all time, and our reintroduction of this legendary form factor, combined with the world's most recognisable consumer electronics brand, is a once in a lifetime opportunity. It never ends, does it? As you might imagine, Wikipedia has more to say about these players. In the beginning, a wonderful team of guys came together to build the best home videogame computer that ever was. They could have stopped at the accelerated graphics and four-channel digital audio, but they didn't. They didn't have to add a high performance multitasking OS, but they did. Or a windowing system with a high speed auto-configuring system bus. But they did. This was 1985. What were -you- using in 1985? It sure as hell couldn't touch this. Having finished the box and exhausted all their venture capital, Commodore rescued the fledgling company from the greasy fingers of Atari computer schlockmeister Jack Tramiel at the 11th hour and embarked on a strange journey that kept the company alive for the next 10 years. A huge success internationally, the Amiga lost its strong position in the US early on. There is no room for a third place finish in America. Amiga designer (and former Atari engineer) Jay Miner died in 1995 along with Commodore. A kind and gentle man, we all miss him dearly. Escom AG of Germany (The Deutschland's 3rd largest PC manufacturer) bought out the once billion-dollar company for a paltry $16M in 1995 after a bidding war with and promptly spun off Amiga Technologies GmbH to manufacture the machine, possibly for use as a set-top box. After some floundering attempts at reselling the technology to (as home Internet surf box with help from Netcom) and QuikPak (the OEM hardware contract manufacturer that had actually been building all the post-Commodore Amigas), Gateway 2000 bought the whole thing in March ('97?). Several former Amiga Technologies staffers rolled along with the buyout, reestablishing headquarters in Germany. Gateway (formerly Gateway 2000) ultimately reduced the Amiga to little more than a brand name for an unreleased Linux internet-appliance soon after releasing the last official Amiga OS, 3.1. Even this strategy didn't last long, as shortly thereafter Gateway disbanded its two California R&D operations and sold the legacy inventory & technology (but only licensing the patents) to a mysterious fan-run company, Amino. Amino changed its name to after the ink was dry, making their official debut three months later at the Gateway 2K Amiga show in St. Louis. There should have been a big banner over the hotel saying "Abandon all hope ye who enter here", because that's what the show felt like. Not having gone to an Amiga show since Commodore days, I just had to find out if the Amiga was going to sink or swim. As proud as I am of the handful of developers still maintaining the platform in this dot-com era, the general consensus was "sink". Although Amiga, Inc. may hang around until the VC money runs out, Amiga the platform has been completely retired. It's over, folks. For more sound-offs regarding this event, visit Squid's Amiga Page And Rumor Mill. I was exceedingly lucky in that I codeveloped the final two incarnations of the Amiga's first "killer app", Electronic Arts' Deluxe Paint. Even today it is regarded as the Photoshop of animation packages among professional game developers, and has sold hundreds of thousands of copies. Very few people were lucky enough to turn their love of Amiga hacking into a long paying gig, and for that I am grateful. The Video Toaster was the machine's other killer app; its company, NewTek, is still around. Their very first product for the Amiga lives on today as the as Play, Inc.'s Snappy video digitizer for the PC. Another keeper of the flame was former Apple exec and Amiga admirer Jean-Louis Gassè, whose Be Corp embraced the Amiga philosophy on the Power PC. Be was sold to Palm in 2001 a few years after losing the bid to NeXT as the basis for Apple's next-generation operating system. Looked at in a different light, the BeOS (and its platform, the BeBox) could have been to Apple what the Sparcstation was to Sun; a computer spinoff that got reabsorbed back into the company, revitalizing it. 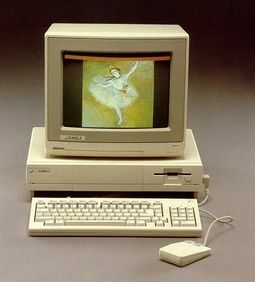 The svelte A-3000, a 25MHz 68030 machine. My favorite. There are hundreds of Amiga-oriented sites on the Net, but the most useful are certainly the emulator projects, such as the Ultimate Amiga Emulator and the boffo commercial Amiga Forever package from Cloanto. These folks deserve your support! For the entire amazing yet tragic tale of the history of Commodore, check out Brian Bagnall's new epic On The Edge: The Spectacular Rise And Fall of Commodore, available on Amazon.